I was in Wellington on Saturday and dropped in to see Dave the Brewer at The Pheasant. He’s only been brewing beer in town for six months, and he’s already expanding the operation, dipping his toe into a bit of cider-making. In a few weeks, a cider press will arrive in the yard of brewhouse, and on Saturday 1st November, we’re all invited to watch it work its way through three tons of cider apples. My dad Ken the Butcher – another Market Street fixture – will be making a batch of pork and apple sausages for the occasion. They’ll be cooking from about 1 o’clock, so stop by for lunch. In the short time it’s been open since Dave took it on, The Pheasant has become a very popular place – not only for real ale-drinking, but for light lunches and morning coffee. In fact, its popularity for the latter makes you wonder why there aren’t more decent places to get coffee and cakes in Wellington. (And when I say decent, I mean places which don’t play Beacon Radio in the background or mummify their scones in clingfilm). But more than a good pub, it’s a place that points to what a positive future for Wellington could be like. Why? First, because it has a broad appeal based on quality, rather than being too rarified on the one hand or ‘bargain basement’ on the other. Second, because it isn’t about fighting supermarkets or the internet for retail customers, it’s about providing a place for people to meet and socialise in pleasant surroundings – and that will always be a winner. And third, because it isn’t just about selling a standard product you can get in a thousand other outlets – it’s about actually MAKING something unique, there on site, and giving people the experience of seeing that process unfold. My dad’s butchers’ shop ticks some of the same boxes, along with one or two other businesses in the town. More than anything else these are characteristics that Wellington’s businesses need to display in order to build their own – and Wellington’s – USP (unique selling point). The thing is, we’re never going to be a brand town of nationwide retailers, and nor are we going to be a pretty tourist town lined with upmarket boutiques and galleries. But we can be a warm, welcoming place where good things are done well – a town of makers and meeting places, fairs and festivals. The Pheasant, with its cosy interior and its brewery and its one-off events, is leading the way. All we need now is for a few more businesses to follow the example. 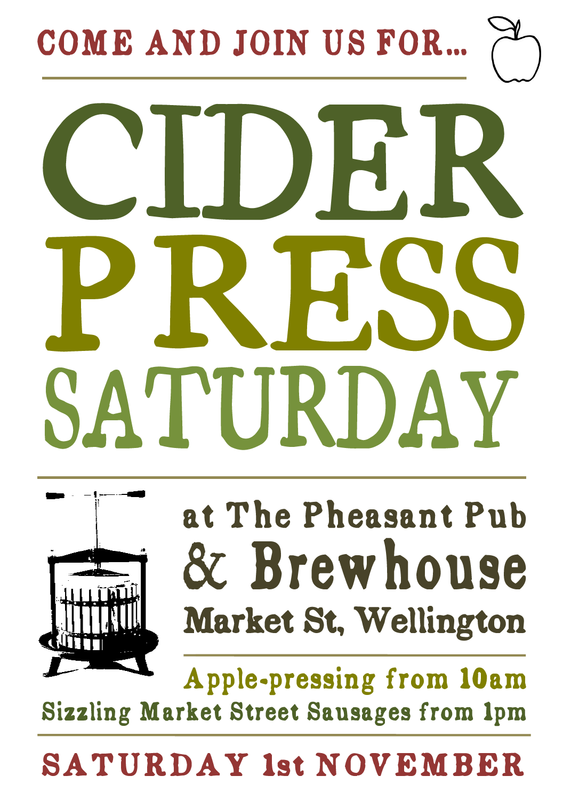 See you at Cider-Press Saturday!